Two cozy seats and a little place to meet. This functional kid-sized furniture set creates the perfect little space to do and discover, make and master, work and wonder! 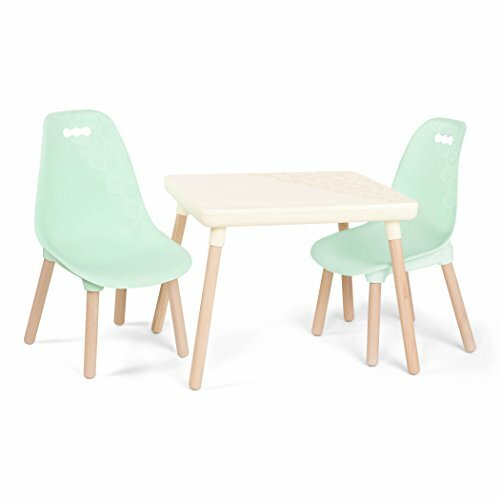 Sized perfectly for toddlers or kids a little older, there's so much you can do with this petite table for two! Snack time or tea time, crafts and creations, just use your imagination! Bringing more friends to the table? Add two more chairs with the kid century modern: chair set. 3-Piece set: This kids furniture set includes 2 comfy kid-sized chairs and 1 trendy table. Activity table set: perfect for crafts, creativity, or a cozy tea party! Rest your feet with these two petite seats. Solid legs: sleek and sturdy for added stability and style. No tools needed: Super easy assembly, just spin the table and chair legs on! Cleaning's a breeze: wipe this toddler table set with a damp cloth and voila! Party of Four? Add 2 more kids chairs with our Kid century modern: chair set. Age & Weight: This child table chair Set is for kids 3 years + and maximum weight for the chairs is 154 lb. or 70 kg. Trustworthy: Bat tat is a family-owned company that has been established in 1897. B. Powerful: we.Org receives a portion of sales from every B. Toy purchased.